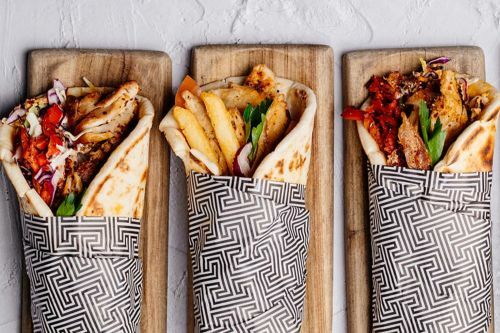 Menulog delivers for Zeus Street Greek - Northpoint so you'll be able to track your courier on a map. Combo comes with chips and drink. Lamb shoulder with slaw, parsley, housemade mustard mayonnaise and eggplant dip. Chicken thigh with house-made tzatziki, tomato, onion parsley, paprika & chips. Can be made gluten-free. Pork neck with house-made tzatziki, tomato, onion parsley, paprika & chips. Can be made gluten-free. Lamb shoulder with housemade tzatziki, tomato, onion parsley, paprika and chips. Grilled halloumi, olive tapenade, roasted red peppers, baby cos lettuce, tomato and mint. Vegan. Lightly fried zucchini falafel, roasted red peppers, baby cos lettuce, tomato, onion, paprika and eggplant dip. Chicken schnitzel tenderloins, slaw, baby cos lettuce and garlic aioli. Chicken, slaw, roasted red peppers, parsley, garlic aioli and spicy feta dip. Pork, pickled cucumber, tomato, baby cos lettuce and housemade mustard mayonnaise. Build your own meal for one with a choice of protein, two sides and a dip. Skewers of meat cooked over hot coals. Served with pita bread, tzatziki and fresh lemon. Combo comes with chips and drink. Skewers of meat cooked over hot coals served with pita bread, tzatziki and fresh lemon. Can be made gluten-free. Lamb shoulder cooked over hot coals served with tzatziki, pita bread and fresh lemon. Can be made gluten-free. Yia Yia’s famous chips seasoned with pink salt and oregano. Yia Yia’s chips topped with crumbled feta. Warm rice medley infused with tomato salsa, onion and herbs. Hand cut halloumi chips dusted in tapioca flour and lightly fried served with smoky yoghurt dip. Beetroot, feta, rocket and almonds dressed in a honey vinaigrette (Gluten free). Cabbage, garlic aioli, currants, mint, crunchy corn and parsley topped with grated halloumi. Vegan. Tomato, cucumber, onion, oregano, olives and feta dressed with extra virgin olive oil. Chicken schnitzel served with small chips and apple juice. Chicken and tzatziki pita served with small chips and apple juice. Falafel and tzatziki pita served with small chips and apple juice. Traditional Greek doughnuts drizzled with honey, cinnamon sugar and walnuts. Traditional Greek doughnuts drizzled with Nutella and walnuts.